This is my first truck for Simutrans, Jockey TABF (the name is invented) I'm doing the first tests because someday I would like to start a roadtrain pak... : .... I'll create 4 or 5 long trucks. Now seriously… It looks good, and any complaints I had diminished in the final size. It looks good, and any complaints I had diminished in the final size. A new cement mixer: Jockey CCO Mixer. A small and fast concrete mixer: Austin 1300. Am I alone with the feeling your trucks have strangely placed wheels? EDIT: Sorry, in this series it's only the last. P.S: I don't know if there's any constraint about having 2x1 loading bays, Any idea? You can make a stop like a busstop. What I had in mind is to create both versions. A large terminal loading bay which will go at the end of a road track and a large continous loading bay that has two exits/entries. I guess I will use the current loading bay graphics..
And when you make a second stop, who look like the loading bay (like bus stop)? You can build it before the one and you have a 2x1. But it is only a idea. A quick test of a possible design based on the single tile loading bay currently available. And can you pak it? I mean, can you show me the dat? I doubt that it will work that way. AFAIK there's a difference between a building that is placed next to a way (=extension) and one that is placed on a way (=stop). Perhaps I used the wrong example. I didn't mean you code it is as an extension building, but I guess It's possible because large train stations exist. I think a possible dat file for that could be..
...and you need to create a 2x1 stop from the single tile stop png file. What I don't remember is if terminal stops, which are placed at the end of a road track, need to be 1x1 size or can be larger. If there's any restriction in that sense, I guess it also may be coded as a busstop with enables_ware=1, so that it can manage freights too. Any stop with a way must be 1x1 currently. Simutrans cannot handle larger ones. However, with the layout=8 you can make loading bays that change grphics when extenden. I think vilvoh did this in the old archive once. 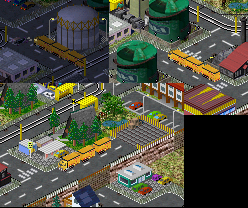 I had working stops in pak128 that used the end loading dock to make a bus stop-like extension as a separate stop right after it became possible to have more than 2 units (a truck plus 3 trailers, for example). I don't know what I did what that, but it looked just like the single access loading bay in the picture on the first page. Road trains never went mainstream, so neither did my loading dock. It's good to see they are making a surge here. [..] with the layout=8 you can make loading bays that change grphics when extenden. I think vilvoh did this in the old archive once. If I did it, I don't remeber right now.. ...I think Frank mentioned something about that issue some thim ago. If I remember correctly, it was a topic about large train stations. Anyway, you mean to use Dims=2,1,8 instead of Dims=2,1,4 following this scheme? I may need some help...could anybody give me a quick explanation about how to code it in the dat file, please? No, as prissi wrote, you can only place 1x1 sized objects on any way. look here for more info (in German only, I'm afraid - but the table shouldn't be that hard to translate via google or so). With those, the graphics shown there and a little experimenting, you'll probably get it working pretty soon. Thanks for the info, DirrrtyDirk. BTW, Is there any sample of this somewhere in the SVN? Perhaps the large dock? Does Tilecutter support this feature? Vilvoh you can make 2 stops. A first one for the end ( 1,1,4 ) and a second as an extension ( 1,1,2 ). I don't know an other way. Well, not now. But it could be added, maybe? YOu can have it with layout=8, but then it would still allow to connect a road to the end tile. well, It doesn't matter. It's clear...I will try it at the weekend. I've done this GMC CrackerBox 238 from 1965.